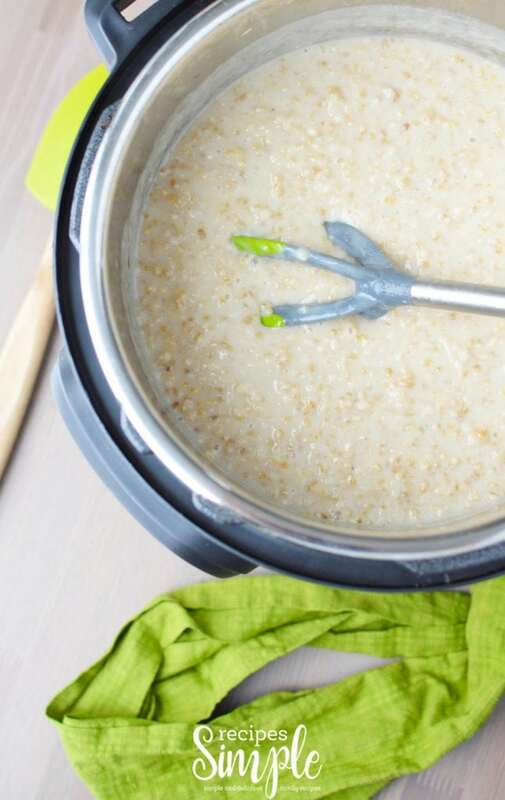 Instant Pot Steel Cut Oats are a healthy breakfast to start your morning. 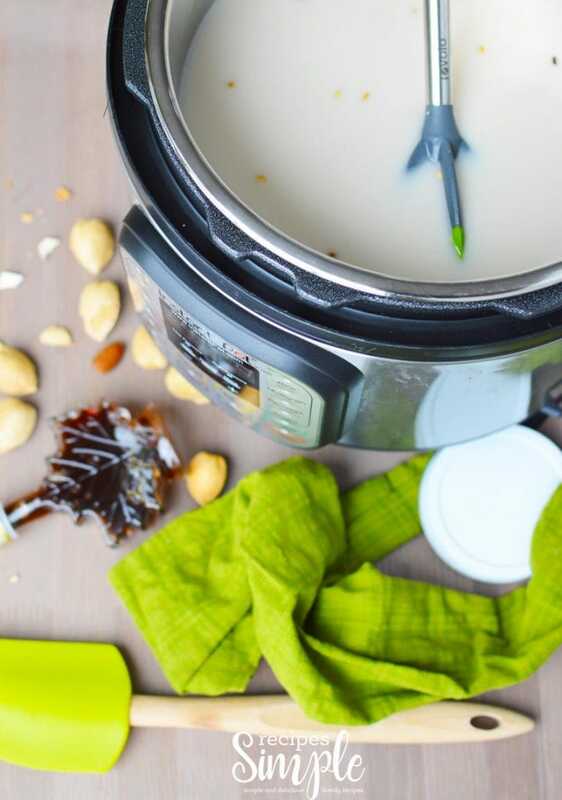 Cooking your Steel Cut Oats in the Instant Pot is quick and easy. It’s the perfect breakfast for those busy mornings when you are in a hurry. Oats are a healthy breakfast and Steel cut oats are less processed than other oats which helps keep you feeling full and satisfied longer. 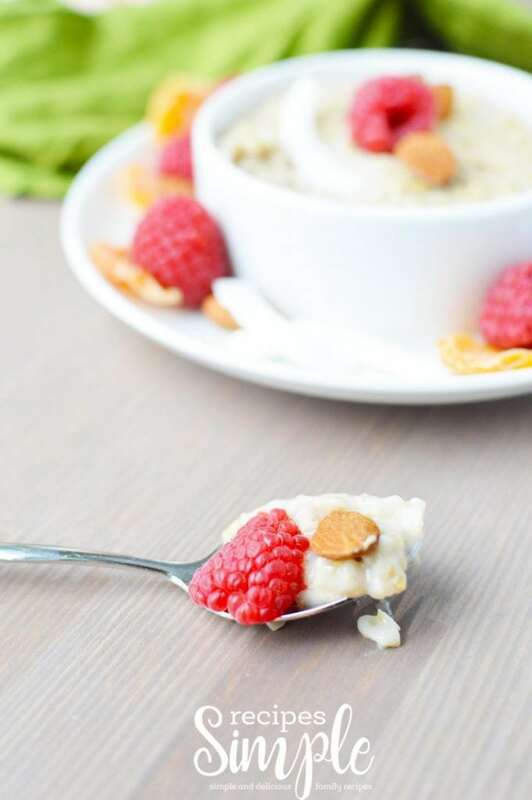 Instant Pot Steel Cut oats are so good and you can add your favorite toppings such as coconut flakes, peanut butter, fruit, berries or nuts. 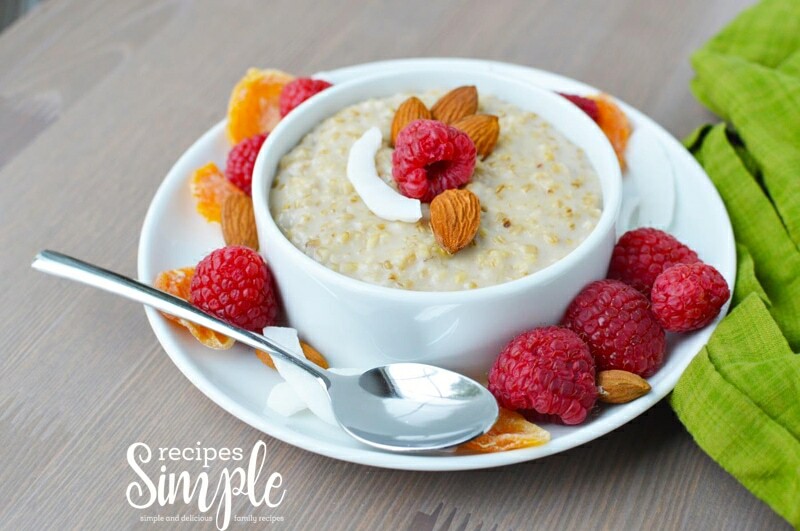 To make these delicious Instant Pot Steel Cut oats you’ll need maple syrup, steel cut oats, water or milk, coconut oil or butter, raspberries and almonds. If using milk instead of water, I recommend using almond milk or coconut milk. See printable recipe below for full ingredient list and directions. 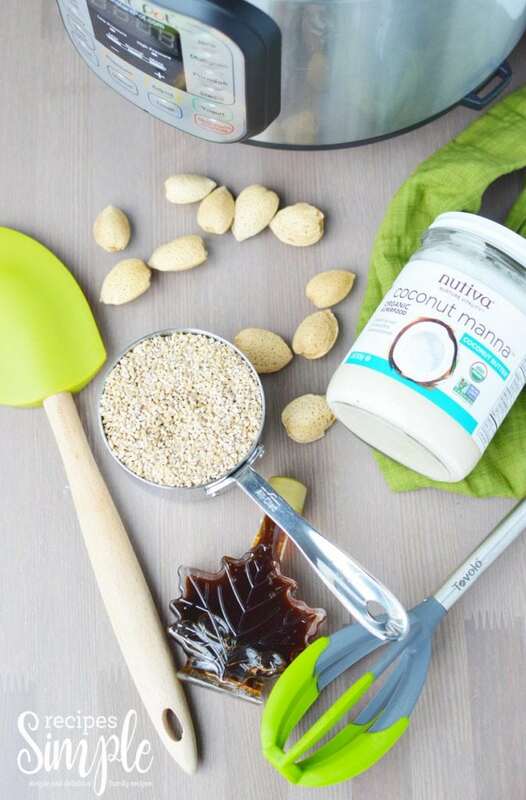 Select the sauté mode on your Instant Pot and melt the coconut oil or butter. Add the steel cut oats and continually stir for 3 minutes. Carefully pour in the liquid (water or milk) and maple syrup. Stir really well for a full minute to make sure nothing is clumped or sticking to the bottom. Lock the lid in place. Cancel the sauté mode and then select the manual mode, high pressure for 10 minutes. When the pot is done cooking and beeps, let it natural pressure release for another 10 minutes before carefully removing the lid. It will look like the oats have too much liquid when you first open it, but stir them well and give everything a minute to thicken and you should have a fantastic consistency. Carefully spoon some of the oats into your favorite dish and then top with the fruit and nuts. This is a perfect meal for making ahead of time! Double the recipe to have enough for the whole week. 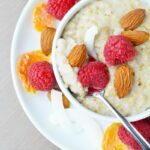 Instant Pot Steel Cut oats are delicious and you can add your favorite toppings such as coconut flakes, peanut butter, fruit, berries or nuts. It’s the perfect breakfast for those busy mornings when you are in a hurry. 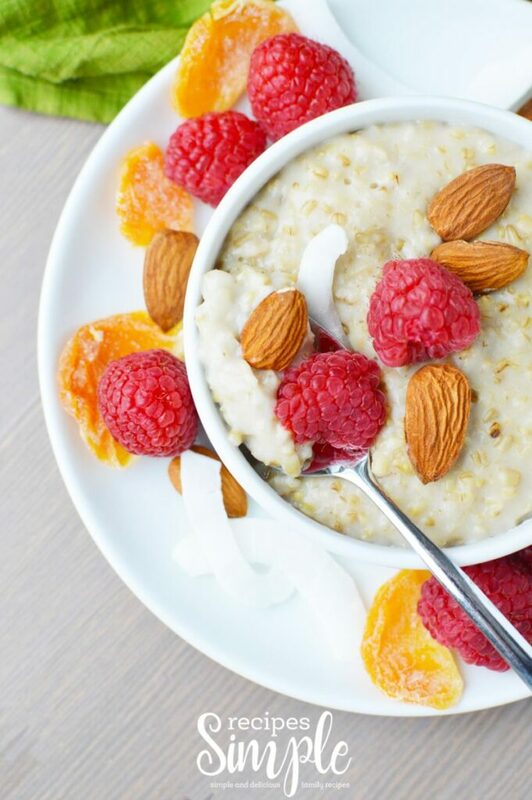 Any combination of the following: raspberries, almonds, dried clemintines and dried coconut flakes to top the oats. Select the sauté mode and melt the coconut oil or butter. Add the steel cut oats and continually stir in the oil for 3 minutes. Carefully pour in the liquid and optional maple syrup. Cancel the sauté mode and then select the manual mode, high pressure for 10 minutes. It will look like the oats had too much liquid when you first open it, but stir them well and give everything a minute to thicken and you should have a fantastic consistency.